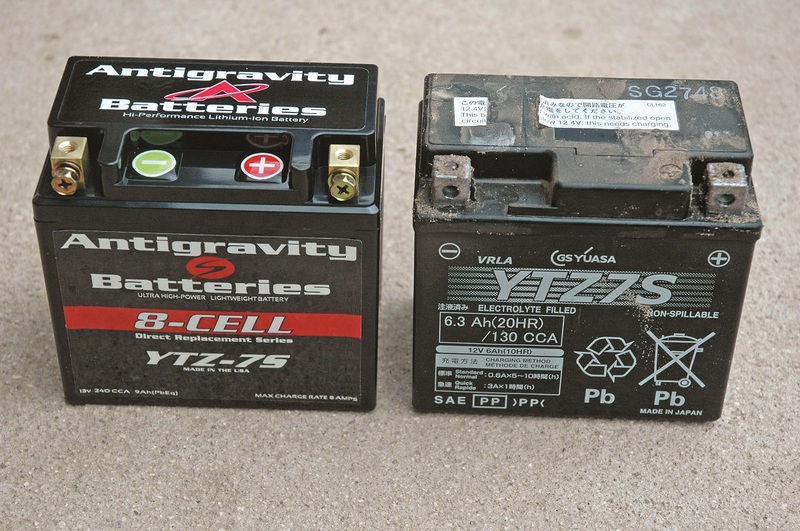 Lithium batteries make life easier for ATV and UTV enthusiasts by holding a charge much longer and providing more cranking power than conventional lead-acid batteries—and they’re far lighter. What’s not to like? Many lithium batteries are smaller than stock batteries, which means you have to pad the battery compartment to properly support the battery and position it so the battery cables reach the battery terminals. It sounds simple, but not all of us are good fabricators. Antigravity’s stock-size batteries are available for many popular ATVs and UTVs, and they come with the exact case size and terminal location of your machine’s stock battery, so no modifications are needed. Installation is a simple drop-in affair, just as with an original-equipment battery. Lithium batteries are typically about twice the price of high-quality leadacid batteries, and Antigravity’s OEM case models are too. A good lead-acid battery for the machine we used for this test, a Honda 450R, is about $90. Antigravity’s stock-size battery for the Honda is $180. Installing Antigravity’s stock-size battery for the Honda 450R was as simple as installing the originalequipment battery. The case fit the battery box perfectly, and the terminal locations and connections were a perfect match for the stock cables. We like this kind of install much better than the process of cutting and installing padding to support the battery and improvising battery cable routing, which is often the case with “compact case” lithium batteries. Even though the Antigravity’s stock-size battery’s case is the same size as the stock lead-acid battery, it’s more than a pound lighter. We used a nearly new Honda 450R for this test, and even though its stock battery was in excellent condition, it didn’t start instantly in cold weather or when riders mistakenly flooded the engine with fuel by operating the throttle. With the Antigravity battery, the Honda’s starter clearly cranked more quickly, which helped the engine start more easily. In situations where the engine didn’t start quickly with the original battery, the battery lost power and didn’t crank the engine fast enough to start it. The Antigravity battery handled repeated starting attempts much better with less loss of cranking speed. Antigravity lithium batteries also tolerate periods of storage better than lead-acid batteries, delivering strong cranking power after weeks of nonuse. The battery doesn’t need to be charged during storage unless the vehicle has a clock or other equipment that continuously drains the battery. If charging is required, Antigravity recommends that only chargers intended for lithium batteries be used. Antigravity’s stock-size lithium batteries let us enjoy the extra power, long-charge holding ability and light weight of lithium battery technology without the extra installation chores of installing a small-case lithium battery. Unless you need a battery that’s smaller than stock, and Antigravity offers them also, the stock size is the way to go.